A tempered glass is stronger than a float glass and is created by heating a glass at extremely high temperatures and then cooling it rapidly. 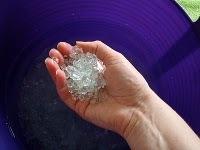 The process results in creation of a tough bond among the elements in the glass. 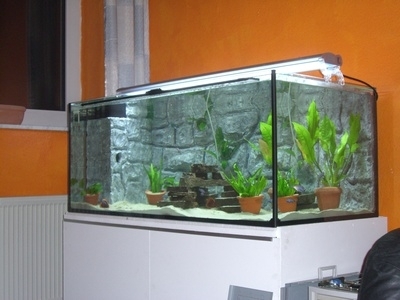 Use of a tempered glass is common in aquarium construction due to its capability to withstand the pressure and weight of the many gallons of water inside the tank. When broken, a tempered glass shatters into thousands of pieces. Usually, tempered glass have a little stamp near one of the corners, which identify it to be tempered. The storm doors and the car windows have these labels. The edges of tempered glass are seldom straight and always have slight warps or ripples. A tempered glass cannot be cut or drilled successfully. All the shaping of the glass must be done prior to the process of tempering. There are a couple of techniques by which it can be determined whether your fish tank is tempered glass. One of the way to determine the character of the glass is through use of polarized sunglasses, which enables seeing a fuzzy blackish diamond or circular pattern in the tempered glass as in a car window. LCD screen and a polarized filter can be used to determine if a sheet of glass is tempered. LCD screens also have a polarized filter set at a 45 degree angle across the screen. The stress in the tempered glass causes light to polarize in a pattern within the glass, which is seen through the polarized sunglasses. You can also place LCD screen behind the glass and look at the screen through a polarizing filter. If the glass is tempered then the LCD screen would be seen as though having lines and stripes. In case it is a plain un-tempered glass, the LCD screen would be absolutely clear. The under mentioned tips would aid in confirming whether a glass is tempered or not. Sight the stamp on the corner of the fish tank. The stamp may also contain certain other alphabets, qualifying the type and quality of the tempered glass. The letter ‘L’ stands for laminated glass. This signifies that a laminate, such as tint or window film, has been placed on the tempered glass, such as tint or window film. ‘T’ stands for toughened glass that means that the glass has been made stronger through the process of heating and cooling. The rest of the grades would indicate the capacity to withstand weight and pressure, with Grade A, B and C being in the descending order. As the tempering process can lead to imperfections, carefully analyze the glass form a 45 deg angle. If there are bumps and waves, then the glass is tempered. Whilst utilizing polarized sunglasses, try and look out for black lines. The tempering of the glass, that is heating and rapid cooling results in some black lines. These lines can be seen through polarized sunglasses from an angle of 45 deg. If you put your hand in front of the fish tank which is made of tempered glass, then whilst viewing through the polarized glasses then you should not be able to use your hands due to reduction of reflected light.